I am getting great response on my simple headband, that I published on Youtube here. I decided to make another video of another headband that is slightly more complex, but still fairly easy to crochet. You can have it done in 1-2 hours - depending on your experience. 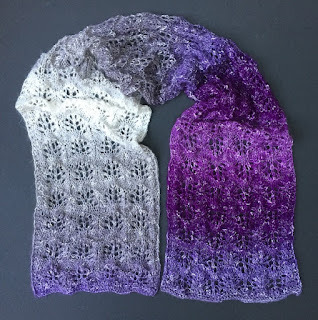 You need to know how to make these stitches: a knot stitch, a slip stitch, a chain, a single crochet stitch, a double crochet stitch, and a puff stitch. Also in some parts I slow down a little so you can follow. 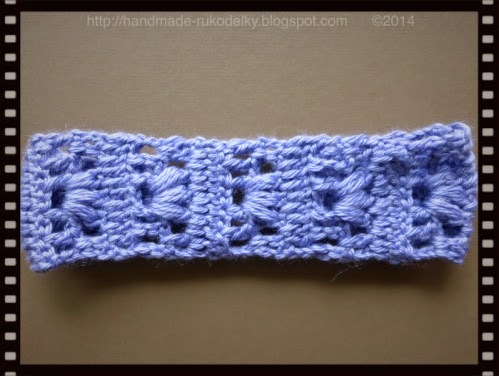 This headband consists of three parts - 2 sides and a pattern part. The pattern part consists of 2 rows that you repeat few times. First measure the head, and then make your headband smaller about 3" (elastic measures about 2" + the crocheted part will stretch too). In other words when you make your first "side part", measure it, then double this number, deduct 3 inches and you will have the approximate measurement for the "pattern part" (=the middle part). You can crochet this headband for your personal use. You can crochet this headband for charity. You can sell your crocheted items where ever you want (ie. at your local craft fairs, online, boutiques...) If you make and sell any of my designs, please be kind and make sure you give me credit. Please, do not sell my written patterns. Thank you very much. Clean up both ends. Enjoy, and please feel free to share.